This stylish crystal paperweight is a great way to thank your loyal employees this holiday season. The paperweight can be reproduced in the shape of your company logo, company mascot or an object that represents your company’s brand identity. 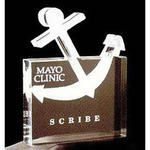 Imprint or engrave your company name, logo and even a holiday greeting for a lasting impression.